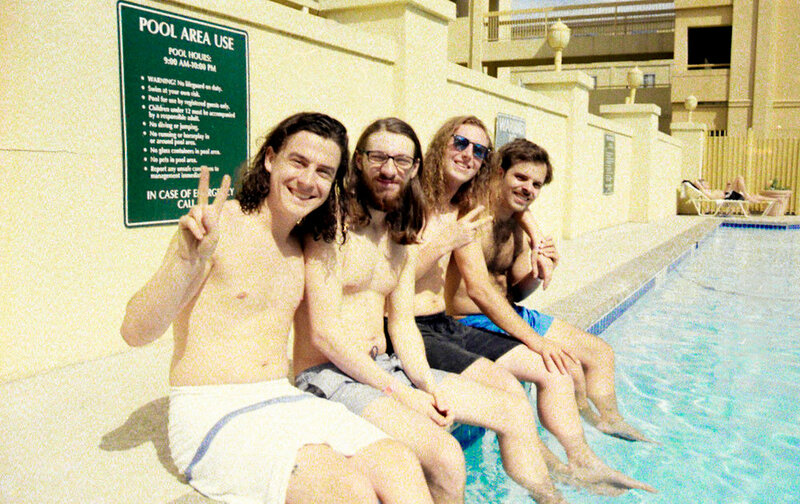 Although their surf-pop makes them sound is as if they have been plucked straight from the beach, the Vancouver band, Peach Pit, has started to make impressions globally. The band consists of bassist Peter Wilton, guitarist Chris Vanderkooy, drummer Mikey Pascuzzi, and vocalist/guitarist Neil Smith. 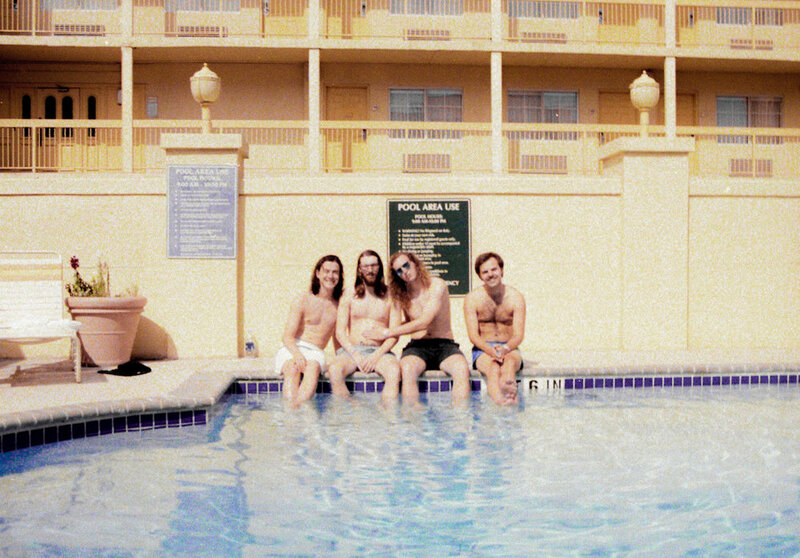 During SXSW, we lounged poolside with the guys talking about their new album, Being So Normal, guitar solos, and staying motivated. I just wanted to start by asking for a brief band background of how each of you got into music. Neil: I was playing in a band for a few years until I was 20 years old. It was a folk band — acoustic guitar and banjo. After that, I wanted to be in a rock band, and then I met Chris. I knew he could play guitar, so we just got together and practiced a song. It was funny because we had a practice we were scheduled to do, and Peter was at Chris’s house. Peter: Chris and I had known each other since I was 5. We’ve been playing music together our entire lives, so we come as a package. Was that band practice the beginning of Peach Pit? Peter: Actually, yeah. Right after that practice was over we were super stoked. We practiced “Peach Pit”, which was the song we played and it was pretty cool and very organic. Did you already have the songs written? Neil, you write all the songs, right? Neil: I had like 3 or 4 songs I wasn’t playing with the other band anymore that I was excited about. Peter has written the chord progressions and the melody and the lyrics overtop of it for a few of the songs on the album. But as far as the songs go, I write the lyrics and the melody. Chris writes his guitar parts, so it’s pretty collaborative. What do you normally do to get inspired to write, and how do you overcome getting stuck in the ‘rut’ of songwriting? Neil: I get stuck all the time. I think I just feel sad about something and write a song about it. Usually, I’m just chilling at home on the computer watching YouTube videos, and I’ll just pause and work on a song for a bit, and when I get bored I’ll just watch some more YouTube videos, not even specifically anything to get inspired to write. Chris: Peter, Neil, and I all had jobs when we were in Vancouver right before we started doing the band full time, and I really found that job where you can zone out completely. I think in those moments it’s kind of nice to just imagine things and have your brain empty. Definitely, a good way for me to work on stuff. You guys released your debut album last September, what was the reaction to that? Did you expect anything of it? Neil: It’s been good, for sure. People still really like songs off our EP, but it’s nice because people are singing along to all the songs on the new album. Between the EP and the album was there an ‘Ah-Ha’ moment where you thought anything needed to change? Peter: All of our songs were written already, kind of in one go over a period of time. We didn’t actually write the EP and then write the album. Chris: We did have one moment after we finished recording the EP and put it out. We sat down for a beer with our producer and were like this has been great, but maybe we should get a little more gritty since the EP felt really clean. So, we started recording the album live on the floor, a little rawer. I read that you guys decided to take the beginning of Peach Pit slowly with perfecting the band and practicing as much as possible before you set out. Neil: Yeah, but that’s funny. We just saw a video of the very first show we ever played and it was so weird to see. Chris: It was fine, but it wasn’t anywhere near where we are today. We did practice for about a year before we ever played a show though, so we could make it to where it wasn’t absolutely terrible. With the album, it’s been great, we really did not expect to see the kind of results we’ve had with it, even only after 6 months. We were just in Jakarta playing a show and there were so many people singing along to the songs! Music travels so fast. It’s crazy how quickly that happens, and as a Canadian band, having people and a fan base across the globe is insane. Neil: Yeah, for sure. Thank you, YouTube. How do you think the album fits into the current music scene? Neil: I think our music is pretty unique. A lot of people have said this, which we didn’t really think about, but we have a guitar solo in every single one of our songs. People are going to be like, 'Oh yeah! They’re bringing back the guitar solo,’ but I didn’t realize people weren’t doing guitar solos. Chris: I feel like Mac DeMarco really made guitar solos a thing again. In some ways, us coming after this new wave of guitar music is definitely a part of that puzzle we’re fitting into. But at the same time, I want to say we’re standing outside of it too. Hopefully writing stuff that is more timeless and not just what’s on trend. Did you decide beforehand about the guitar solos being in every song? Neil: No, Chris just started soloing and we thought we’ll put that in. Chris: I would always be like, ’They’re going to let me do another solo?’ I’m the luckiest guitar player in the world. Neil: I’m not a good guitar player, so there was never ever a solo in any of the songs from my last band. I was always hoping to play in a band that there was a guitar solo. I want to talk about the music scene in Vancouver since there are a lot of artists popping up from Canada recently. Are people pretty supportive of each other? Neil: Yeah, it’s great right now. Our friend's Little Destroyer are an awesome band. Some other bands we really like are down here too. Ponytails and Winona Forever are a couple good friends of ours. Chris: But yeah, there’s not any pretentiousness. Neil: Well, I wouldn’t say that. I think people are pretty welcoming for sure, but it’s also very cliquey until you start getting some success. It was just lots of bands that I didn’t know because there are certain bands who play together and those who don’t. Chris: Yeah, maybe we’re just part of the clique now. It’s true though when we were just starting out it felt like we couldn’t break into certain circles. Now is a lot more accessible. How about the house shows. Do you think seeing local music is important? Peach Pit: Yes, they’re really big. There was this group called Trash City Productions, a DIY, all-ages show promoter, and we got to play a show with them for the first time a year ago. We were so excited because they put on awesome shows. Chris: They’re the cool shows in Vancouver. Lastly, I know the music scene can be tiring. How do you stay motivated to keep creating with the scene is constantly growing, and making sure you don’t stay stagnant? Neil: That’s a hard one, I don’t know. I think it’s just really fun to be in a band. Honestly, getting to play shows all the time and going on tour is cool. Getting to meet people from all over the world is one of my favorite things, so that’s motivation in itself.